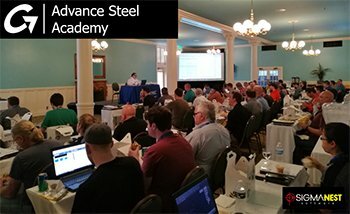 The 4th Annual Advance Steel Academy 2017 in US is a Success! Thank you to everyone who made our Annual Advance Steel Academy a success! We are already planning ahead for next year's event in Baltimore! 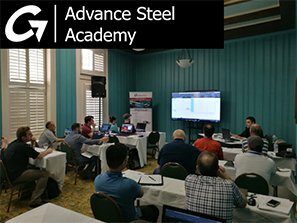 GRAITEC, Autodesk® Platinum Partner, hosted its fourth edition of Advance Steel Academy, an advanced training focused on Autodesk® Advance Steel. This event took place in San Antonio on March 20-22, just before the NASCC, and we welcomed 50 Advance Steel users (this number has doubled from last year!). "The objective of the Advance Steel Academy is for all attendees to develop their Advance Steel skills, learn about trends within the building and construction industry and network with other industry professionals." Hugo Michaud, Sales Director Americas, Graitec Group. The first day was met with a buzz of excitement at the historical Menger Hotel as we anxiously awaited our guests' arrival. 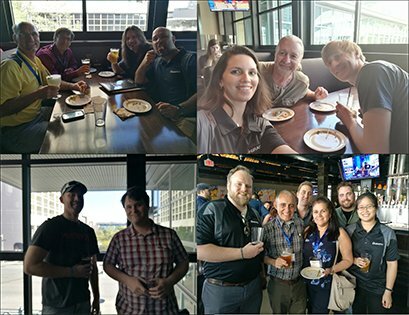 The GRAITEC team welcomed Autodesk Advance Steel users with different backgrounds. Steel and Precast Detailers, Steel Erectors, Steel & Precast Fabricators, Structural Engineers, Contractors, etc. gathered for in-depth workshops, technical sessions and networking. For the third consecutive year, we were joined by Autodesk partners. Michael Gustafson, Industry Strategy Manager for Structural Engineering at Autodesk, talked about Autodesk's vision for the Future of Structure & BIM. 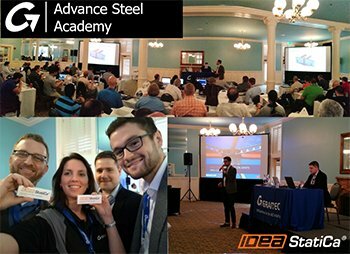 He adds: "Graitec's Advance Steel Academy event was a big success. I've attended this event for three years now, and it has steadily attracted more customers each year. 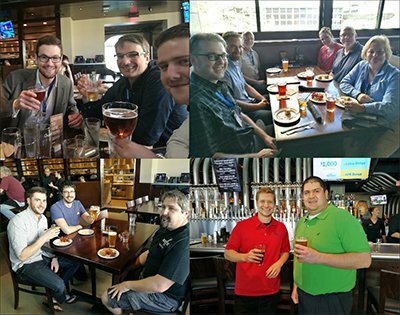 It was a great week having the opportunity to meet with Advance Steel customers at Graitec's event as well as at NASCC." Udo Haedicke, Advance Steel Product Manager, gave an exclusive preview of the new 2018 features. He comments: "What a nice event. Thank you for getting the chance to promote the new features of Advance Steel and the opportunity to chat with so many great customers!" We were pleased to welcome new partners this year: Idea StatiCa and SigmaTEK Systems. Juraj Sabatka, CSO & CFO, and Filip Adler, Product Engineer at Idea StatiCa, presented Advance Design Connection, a steel connection design software reinvented for Graitec customers and Advance Steel users. This solution designs and checks all structural steel joints according to AISC codes in minutes! They demonstrated how Advance Design Connection works with Advance Steel and can save engineer's time. (watch the webinar). "It's great to see such a customer commitment to meet up and get better. GRAITEC team did a great job to make the trip worth for everybody" comments Juraj Sabatka. Al De Avila, Applications Engineer at SigmaTEK Systems, showed how to leverage your steel detailing and plate nesting with SigmaNEST, the world's leading nesting solution for all fabrication machine. He showed the full integration between SigmaNEST, Advance Steel and Advance Workshop (Graitec Steel Fabrication Management Solution). He walked through the transfer of a model, the creation of plate NC files and finally the import into SigmaNEST. Then, he covered how it streamlines the overall production workflow. "I had a wonderful experience at the Advance Steel Academy. 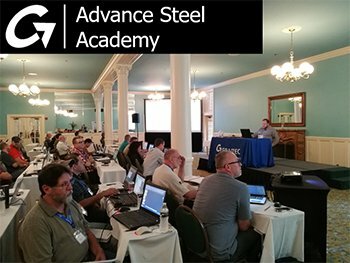 Not only was it good to learn new Advance Steel skills, but it extremely rewarding to meet other professionals using this software. The greatest benefit for me was being able to ask questions of Graitec staff in person and hold prolonged conversations about Advance Steel outside of the office." Adam Beeler, CAD Programmer, Pinnacle Metal Products. 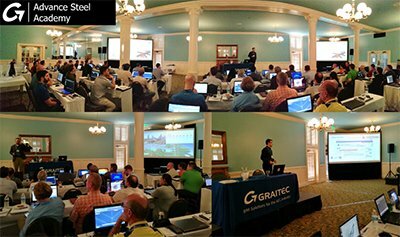 Throughout the training, attendees participated in general sessions where our Graitec experts gave everyone the scoop on what's new, what our developers are working hard on, and ways to use the software better. Breakout sessions commenced so that attendees could learn more about specific functions within the software. Questions and comments were welcomed, as our team members took the time to understand the various recommendations from customers and sought to solve technical problems experienced by some. The success and positive feedback of this event clearly show the users' enthusiasms toward Graitec and Autodesk solutions. Graitec strengthens its professionalism and position as an international BIM provider and Autodesk's renowned partner in North America. "The training this year was so much more informative than previous years. I found myself not able to sleep (in class)!" Terry Werth, Steel Detailer, Klute Inc.
We are so thankful for everyone's participation in this year's event. We believe it was one of the best yet! Citing recommendations and comments, we are looking to make next year's event bigger than ever, filled with more breakout sessions, and one-on-one attention with our experts! 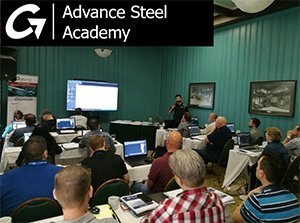 For every Advance Steel Academy, our goal is to educate and excite our attendees for what's to come and how they can further improve their operations using our products. Stay tuned for updates as we begin the planning phase of our 5th Annual Advance Steel Academy in Baltimore.